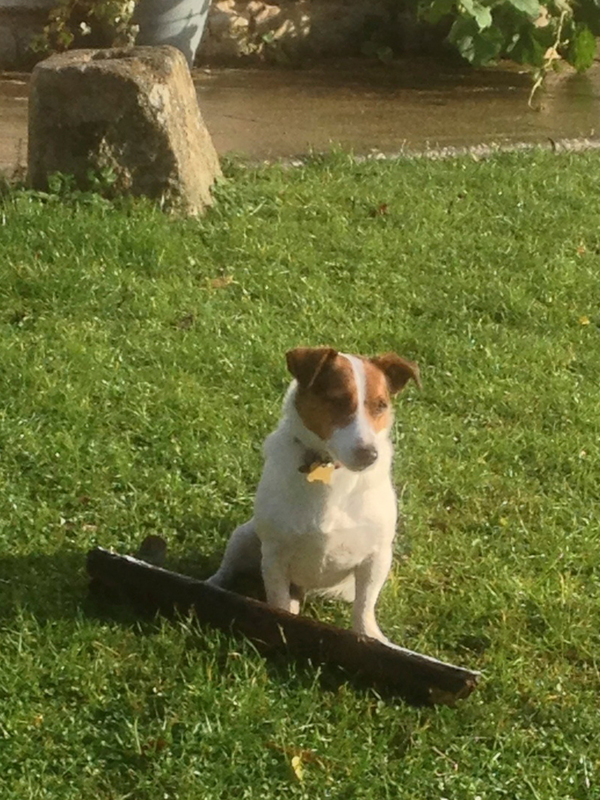 This cute little log collecting dog is called Tui and she belongs to Sotos and his family from the Barn Owl Gallery. At closing up time last night we had absolute panic stations as Tui was nowhere to be found. Poor old Sotos was trying to think of how on earth he would tell the kids he’d lost their beloved pet. We searched everywhere, as Tui does do the rounds of the workshops looking for love and the odd biscuit! We were standing discussing where she might have gone when we became aware that we were being watched. There, in the window of Doug’s Revival workshop was little Tui peering through the glass! Doug had packed up earlier and despite the fact that it takes quite some time to put all his furniture away at the end of the day, Tui had obviously found a nice comfy spot and settled down! Luckily our landlord was just round the corner playing with their grandchildren and went to get their spare keys to let her out. I don’t think Doug would have fancied coming back from Warminster on the bus to free a trapped dog! This entry was tagged arts, dogs, lock in, lost pet, panic, tithebarn workshops. Bookmark the permalink.